Top Brick, NJ Marina with Deep Water Slips and New Bulkheads. new bulkheads, and access to a beautiful community. 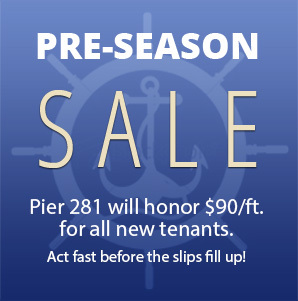 Pier 281 Marina has more than 100 slips and is able to accommodate any size boat from 18 to 75 feet due to its deep water. The marina is an ideal locale for sailboats and larger vessels that draw more water. The slips are clean and attached to new docks and bulkheads because our marina believes you and your boat deserve the absolute best. Water is included at the docks, and the electric charge depends on the vessel and usage requirements. Contact the office for additional details. Additionally, expert customization of slips for larger boats may be available upon request. Pier 281 is able to customize your slip to accommodate the special needs of you and your boat. Please call the office to discuss in further detail to see if this might be an option. Slip prices for 2019 start at $90.00 per foot for new customers if paid in full by March 1, 2019. Sport port jet ski slips are $850. Boat Lift Slips are $5,500 for the season. Call for details. Looking for a slip for just a few nights? Click the link below to book.